Last month the New York Times ran a story about a sculpture based on cutting open a “Menger sponge,” a shape formed by recursively cutting holes through a cube. 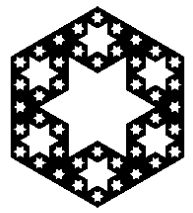 All the holes are rectangular, but when you cut the sponge open at an angle, you see six-pointed stars. Here are some better photos, including both a physical model and a computer animation. Thanks to Mike Croucher for the link. I’ve written some Python code to take slices of a Menger sponge. Here’s a sample output. The Menger sponge starts with a unit cube, i.e. all coordinates are between 0 and 1. At the bottom of the code, you specify a plane by giving a point inside the cube and vector normal to the plane. The picture above is a slice that goes through the center of the cube (0.5, 0.5, 0.5) with a normal vector running from the origin to the opposite corner (1, 1, 1). after the number of iterations given by 'level.' """
# lie in middle thirds. the direction normal to the given plane.""" # not parallel to the normal direction. # to both v and the normal vector. # cutting through the cube. # Specify a point on the plane. Much-belated none-of-my-business, but: Menger sponge slices demonstration, thanks to you.